Mercedes-Benz Australia/Pacific is the importer and wholesaler for a range of premium vehicles, including iconic passenger cars. The Mercedes-Benz Event team required custom-designed AMG Jackets and Caps which are gifted to customers attending their high-end AMG events throughout the year. 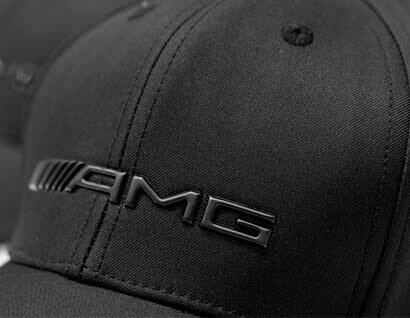 It was essential that the Jacket & Cap complement each other, be casual but stylish whilst reflecting ‘quality’, ‘sporty’ & ‘performance’ of the AMG brand. Adhere custom designed and manufactured a quality soft-shell performance jacket which was sporty and stylish, providing protection against the wind and rain. The jacket featured 3D AMG logo’s, subtle contrasting white piping on the front, two zippered side pockets and custom tonal rubber zipper pullers. A quality 6 panel cap was designed to compliment the Jacket. Made in a premium black fused polyester twill material, the cap front featured a tonal 3D AMG logo and a raised logo on the adjustable black metal clasp. The stylish design was rounded off by the contrasting white of the front of the peak and the underside of the peak and back strap in a carbon-look material enhancing the sporty look.